I’ve often seen these (unmistakably French) ‘Comtoise Morbier’ clock face surrounds or headpieces. They’re usually still attached to clocks, so these two really spoke to me, in the way that displaced and orphaned things so often do! Could there be anything more French? The first thing we did was to chisel off the bodged wood and plywood backing, which was (clearly) not supporting the weight of the glass. There are no signs of any money or illegal substances stuffed down the back, which is sort of a pity. The glass itself is very heavy with hand painted silvering and it has a nice age. There’s also a lovely deep sinuous bevel which it may not be possible to re-create so we want to keep it despite the huge crack. 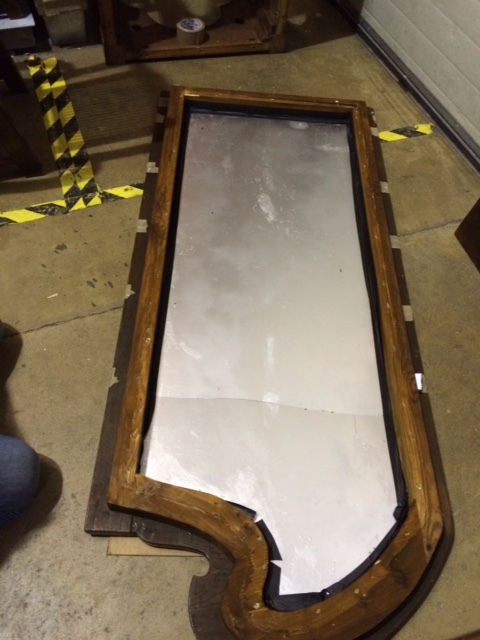 I’ll work on the wood frame and we’ve cut cardboard to provide a cushion between the glass and the backing plate. We will try using a windscreen repair kit to stabilise the crack. 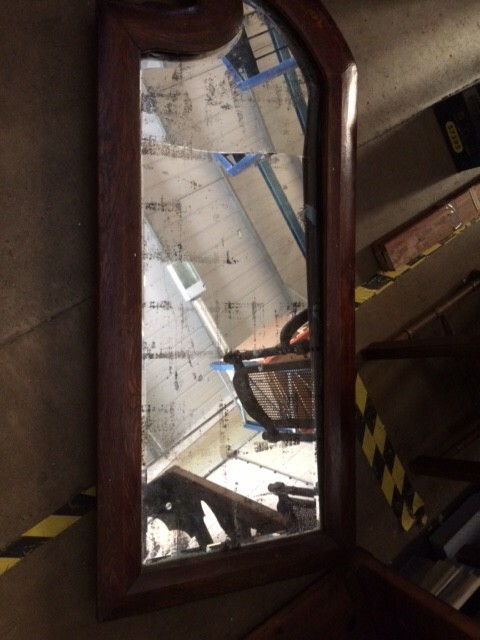 At least we’ll have a stable template for a new mirror if we really cannot live with the break, but just think what this mirror may have witnessed in its lifetime!